Our skin deserves as much care and attention as any part of the body. It is exposed daily to harsh sunlight, pollution, and dirt which may lead to blemishes and premature signs of aging. Skip the hassle of concealing your imperfections by having a go-to skincare product that can easily keep your skin healthy and youthful-looking! A worthy addition to any beauty routine that promises easy application and outstanding results has finally come to the Philippines. 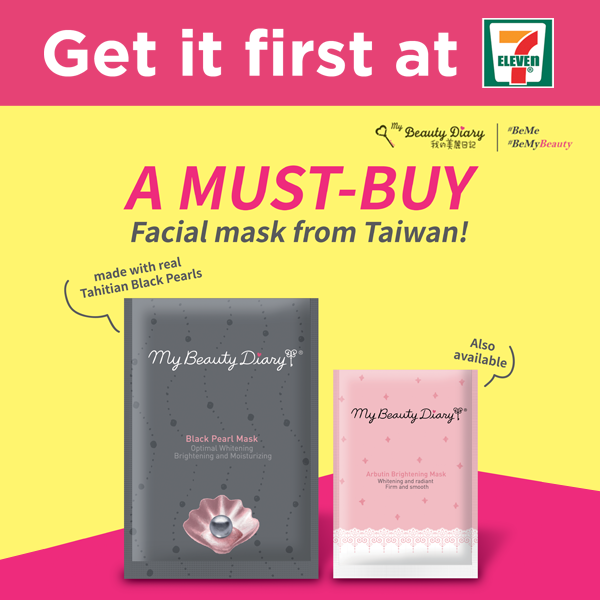 Now there’s no need to ask for friends to bring it back home whenever they travel abroad or even wait for days for online shopping sites to deliver to your doorstep, as Asia’s leading and award-winning face mask, My Beauty Diary is now conveniently available in 7-Eleven stores in Luzon. My Beauty Diary facial mask is a must-have skincare product designed to cater to Asian skin. It's also known to be effective in making your skin glow even after just one use! It’s easy to apply; all you have to do is take out the sheet mask, apply it directly to your face, and let it stay on for a few minutes. It’s literally as simple as 1-2-3! So take a break, pamper your skin, and escape from the stress of everyday life with My Beauty Diary! Now, treating yourself to something special is simpler and more accessible as 7-Eleven is bringing two variants of My Beauty Diary to the country: Black Pearl​ and Arbutin Brightening. Both contain unique ingredients such as Aquaroad and Cosphingo that provide a penetrative and long-lasting effect. The Black Pearl Mask is created for skin whitening and moisturizing. It contains hydrolyzed soy, rice protein extract, and licorice essence, which provide intense hydration to the deep layers of the skin. It also contains the natural active ingredient black pearl, which whitens and softens the skin. This variation is a popular choice for skincare enthusiasts as it can show noticeable results after one use due to plenty of essences in one single pack! Meanwhile, Arbutin Brightening Mask is developed for skin whitening and skin elasticity. It contains a popular whitening ingredient, Arbutin, extracted from a bearberry plant and scientifically proven to be effective in protecting the skin from harmful UV rays as well as preventing melanin formation. As a result, it makes the skin whiter and more radiant, all the while making the skin firmer and smoother. My Beauty Diary is considered the leading face mask brand in Hong Kong, Singapore, Japan, and Taiwan. It has been feted with recognitions like Best Mask by Cosmopolitan in Thailand, Best Selling Facial Mask and Experts’ and Consumers’ Choice in Singapore in 2015, and the Cosme Best Cosmetics Award - First Place in Japan. It has also been honored with various awards in its home country, Taiwan. Just this past June, My Beauty Diary once again took the limelight as it was the only face mask brand included in the official gift bag provided to the presenters, performers, and awardees at the 2018 MTV Movie and TV Awards. 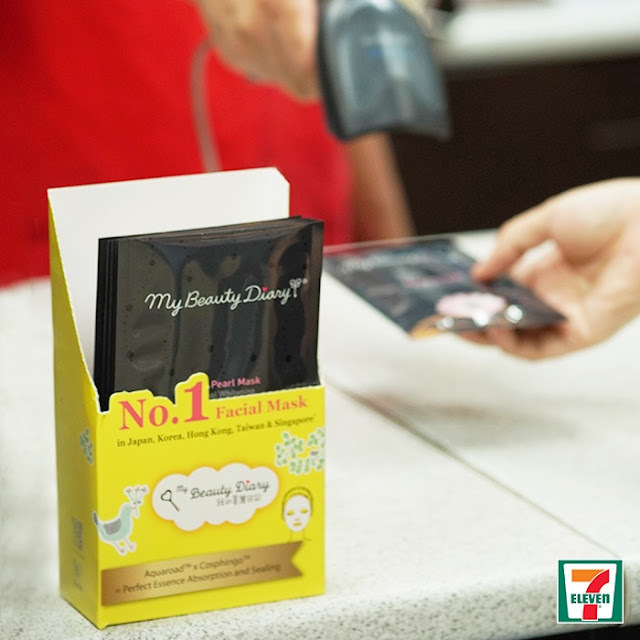 Pampering yourself have never been more convenient, now that My Beauty Diary is at 7-Eleven! My Beauty Diary’s Black Pearl and Arbutin Brightening face masks both retail for PhP89 each in 7-Eleven stores in Luzon. For more information, visit www.7-eleven.com.ph.